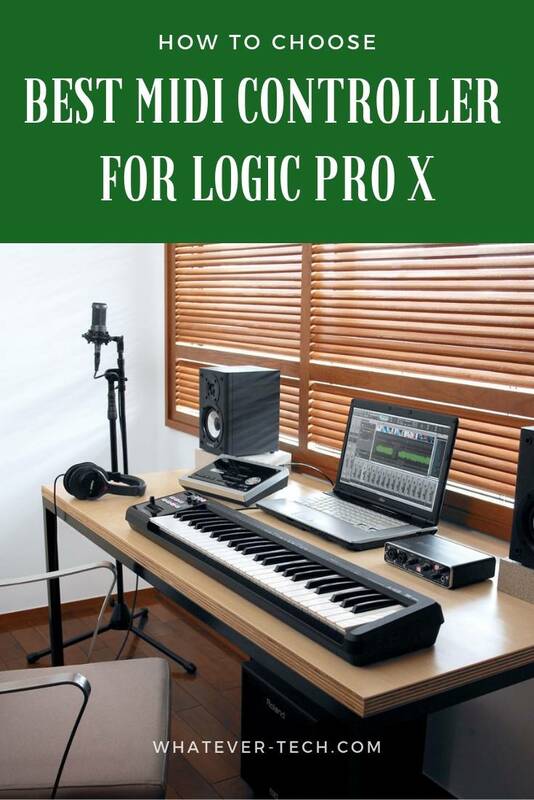 While it is possible to use the digital audio workstation (DAW), Logic Pro X, without a MIDI controller, you’ll find sequencing and recording much easier when using one. A MIDI controller provides a physical interface with knobs, pads and sliders that simplifies settings changes and activating user made presets. Logic Pro X, the tenth version of the Apple product, runs on the Mac iOS. A user can set up their iPhone or iPad to function as a remote to work in conjunction with the program. The DAW offers a digital recording environment with built-in audio effects and software instruments. It works with Apple Loops which provides professional level royalty-free instrument loops. Logic Pro X provides 255 audio tracks and multichannel surround sound mixdown. The software works with MIDI controllers and keyboards for both input and processing, as well as, for MIDI output. 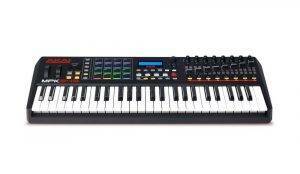 Its MIDI Transform feature lets you edit MIDI sequences for precise note positioning, pitch, pitch-bends and velocity. It also provides a humanize effect. Other aspects of the software include music and drum notation, guitar tablature and chord abbreviations. The program includes software instruments including a drum kit designer, drum machine designer and numerous synthesizers including a retro synth, a vintage clavicle and vintage electric piano. You can activate any of the software instruments by typing into the MIDI notation window or via input from a MIDI controller. The controller can take various forms. 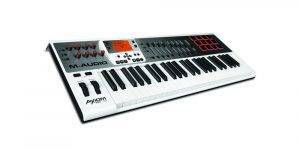 A keyboard design is the most common, but MIDI guitars and drum machines have become more common. Other interfaces are rarer but seen in more complete digital studios such as pad controllers which have drum pads, faders, buttons and knob controls, and hybrid controllers which combine traditional piano keys with the features of pad controllers. 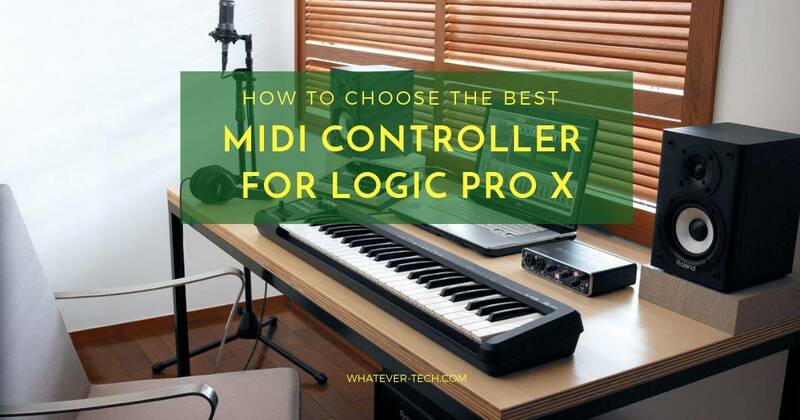 What is the Best MIDI Control for Logic Pro X April, 2019? Akai Professional MPK249 49 semi-weighted, full-size keys with aftertouch LCD Display USB bus or USB charger (sold separately) / power adapter (sold separately): 6V DC, 1A, center-positive 29”(L) x 12.25”(W) x 3.38”(H) 12.6 lbs Check price! Alesis VI49 49 full-sized, square-front, semi-weighted keys with aftertouch LED Display USB bus / power adapter (sold separately): 9V DC, 500mA, center-positive 37.6”(L) x 12.4”(W) x 4.5”(H) 11.0 lbs Check price! 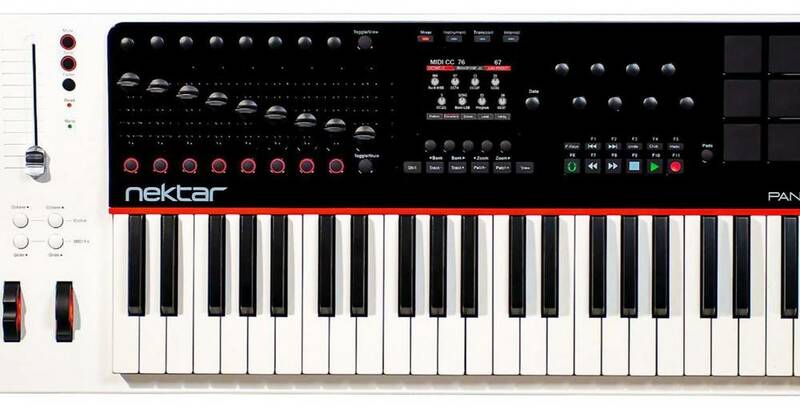 Akai Professional MPK Mini MK2 25 velocity-sensitive synth-action keys No USB bus 12.5”(L) x 7.13”(W) x 1.75”(H) 1.65 lbs Check price! Novation AMS-IMPULSE-49 49 Ultra-responsive semi weighted keys with aftertouch LCD Display USB bus 33.3”(L) x 13”(W) x 3.93”(H) 11.02 lbs Check price! 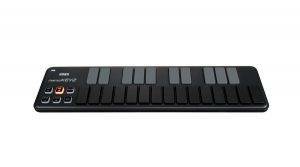 Korg Nanokey2 25-key with velocity No USB bus 12.8”(L) x 3.27”(W) x 0.65”(H) 0.54 lbs Check price! Nektar Panorama P4 49 note semi-weighted, velocity-sensitive No USB bus 39 5/8”(L) x 13”(W) x 3 6/8”(H) 17 lbs Check price! 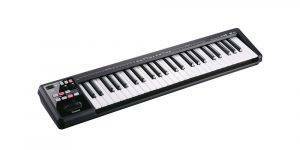 Roland A-49 49 keys with velocity No USB bus 32-15/16”(L) x 7-3/16”(W) x 3-5/16”(H) 5 lbs Check price! 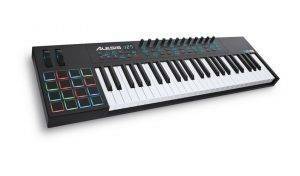 M-Audio AxiomAIR49 49 expressive synth-action keys with aftertouch LCD Display USB bus / power adapter (sold separately): 9V DC, 500mA 22”(L) x 15”(W) x 4”(H) 10.8 lbs Check price! 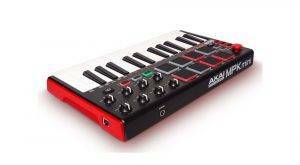 Let’s open with the best controller out there, the Akai Professional MPK249 MIDI controller, which is iOS compatible. It is designed for use in a professional studio. It offers 49 velocity sensitive, semi-weighted, full-size keys. It provides a comprehensive interface that lets the user alter the virtual instrument and its operation. You’ll find two high definition virtual synthesizers that vary their capabilities from warm analog to futuristic synth sound. The controller also provides an after touch option. Key Feature: all-in-one controller that includes both keyboard and trigger pads. 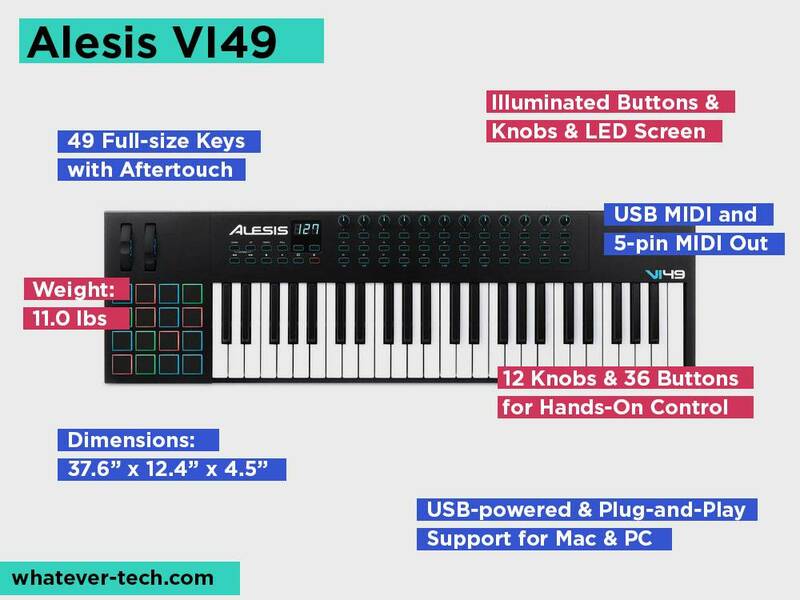 The Alesis VI49 MIDI controller offers the greatest sound flexibility of any Logic Pro X controller because it provides 49 full-sized, semi-weighted keys, 36 buttons and 12 controller knobs that you can assign to different sounds then edit and alter them. Its design makes it equally useful in the studio and as a live instrument. Its keys respond well to velocity and pressure for realistic piano sound. It offers a built-in blue LED display that tracks your position in the score. It is easy to see even in low light conditions. Key Feature: Greatest Flexibility from Its 49 Keys and 48 Controls. 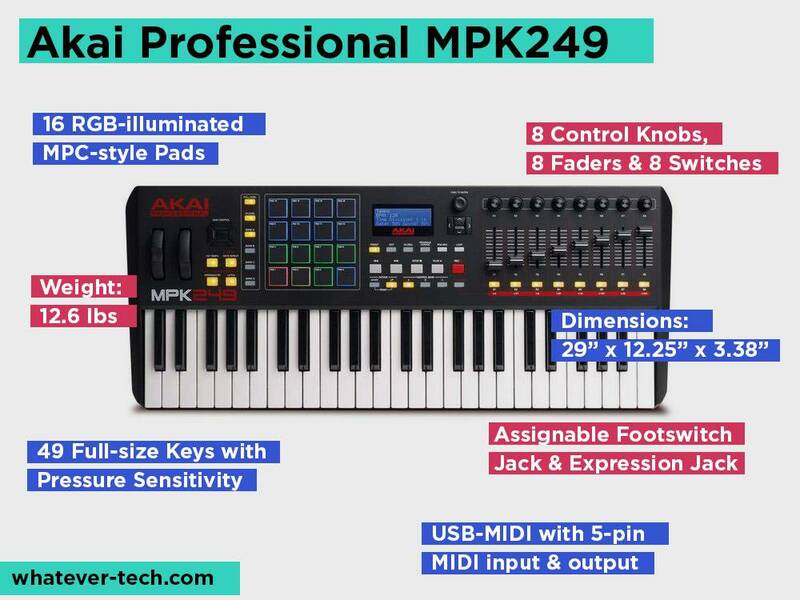 Choose the Akai Professional MPK Mini MK2 if you’re new to home recording and MIDI. It offers a lower price point than most and a good learning environment. It’s extremely portable. 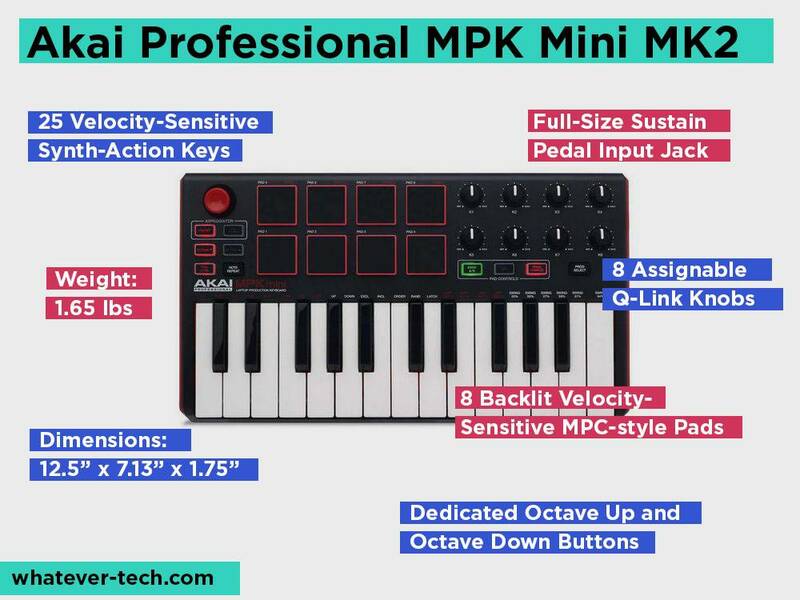 It features 25 miniature keys with three touch sensitivity settings, eight backlit velocity-sensitive MPC-style pads and eight assignable Q-Link knobs. Smaller than a laptop, it still packs in the power of a larger design with eight rubber, velocity sensitive pads and eight programmable knobs. It comes with two sound banks. It uses a more compact thumbstick design to replace standard pitch/mod wheels. The unit also provides dedicated octave up and octave down buttons. Key Feature: Extreme lightweight portability. 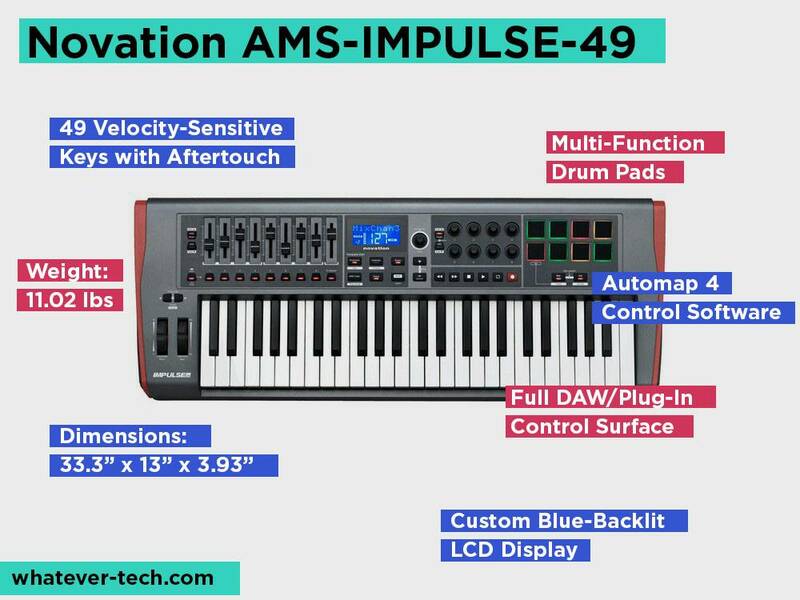 The Novation AMS-IMPULSE-49 provides the best midi controller for Logic Pro X due to its modern design, quality automapping software and ultra-responsive keyboard. Its software, Automap 4, integrates with Logic Pro X. If you want to experiment with another DAW, it comes with Ableton Live Lite. You’ll also get a taste of Novation’s bass synth and loop masters in the complimentary sample pack. You can control your mixer and transport controls, plus leverage effects, plug-ins and VSTs. Its semi-weighted keys with aftertouch perform well in concert settings and the production studio, as do its faders and knobs. Other hardware features include multi-function drum pads that let you roll beats and warp arpeggios. Its assignable aftertouch feature provides the feeling of playing a piano. You’ll choose your Impulse by choosing its 25, 49 or 61 key model. It also features eight knobs, nine faders and buttons and an LCD screen so you can track your place in the score. Key Feature: Comes in your choice of 25, 49 or 61 keys. 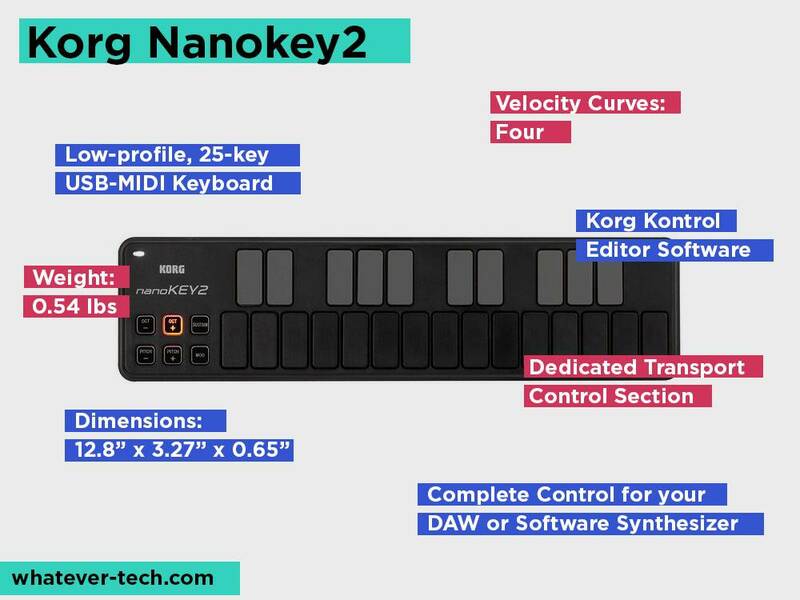 The Korg Nanokey2 weighs next to nothing compared to most MIDI controllers. You can tote it in a backpack since it only weighs 0.54 pounds and measures just over one foot in length. You’ll get 25 slim-line keys, a 16 pad slim-line drum pad controller, eight faders, DAW control buttons and an X-Y touchpad, plus octave and mod buttons. The Nektar Panorama P4 controller comes in multiple versions. Choose from a semi-weighted or weighted keys in a 49 or 61 key layout. The controller also includes 12 velocity sensitivity pads, 16 encoders and 28 buttons. It also features 10 assignable LED buttons and nine 45mm faders. Its channel strip control easily associates with Logic Pro X to provide easy access to inserts, EQ and sends. It works with Logic Pro X and many other DAWs including Cubase, Bitwig Studio, Main Stage and Reason. Key Feature: Comprehensive controller with buttons, encoders, keys, pads. Musicians know the Roland brand well. The firm manufactures a number of musical instruments. 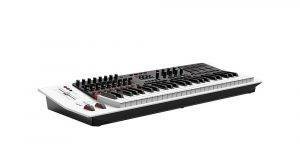 Roland A-49 provides a durable MIDI keyboard controller that easily interfaces with Logic Pro X. This lightweight instrument transports to gigs easily since it weighs only six pounds. It features 49 full-size keys with velocity sensitivity. Like many of the other controllers in this guide, it uses a USB cord to connect to the computer for power. One of its unusual features is the D-Beam which the user activates by waving their hand over the D-Beam controller. The beam is invisible, but the activating motion boosts the sound and adds color to it. Key Feature: Reliable Roland Design. The M-Audio AxiomAIR49 offers a 49-key MIDI keyboard known as the best for mapping with Logic Pro X. 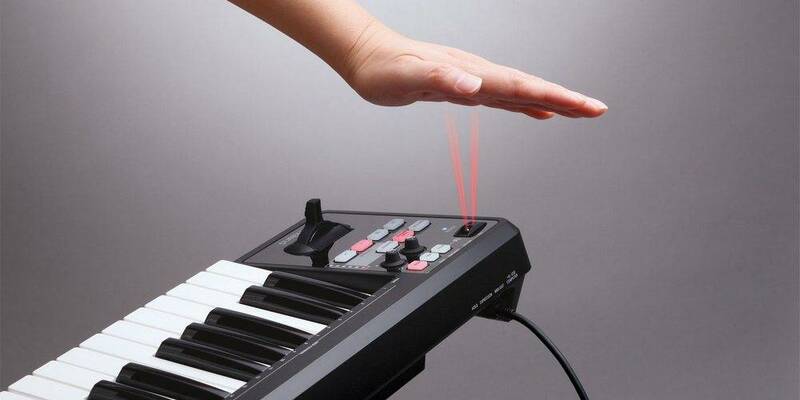 Besides its full-size, synth-action velocity-sensitive keys, it also provides eight velocity-sensitive trigger pads and eight assignable knobs. The pads and knobs enable beat production, launching clips, mixing and plug-in activation. It also provides modulation and pitch wheels and it comes with a software bundle that includes Pro Tools, First and Eleven Lite, plus the Virtual Instrument Player (VIP). Like many devices of today, it uses a USB connection to the computer for power. While we’ve jumpstarted your shopping for a MIDI controller for Logic Pro X by reviewing the top five devices, you may decide you’d like something else instead. Here’s a short rundown on what you need to look for in a device. Check with which operating systems the hardware device is compatible. Not all controllers work with Mac iOS. Some controllers work with multiple software programs. You can find controllers that come with a bundle of two or three software that works together. Evaluate the keyboard for ease of use. Check the response of the keys. Change the settings, especially the aftertouch, then try the keys again since this can alter the response. Also, pay close attention to the tone. 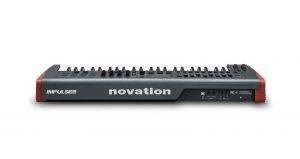 Determine if you want synth action, semi-weighted or weighted keys. How many keys do you want? Try reading the LCD display in various lighting conditions. It should provide an easy view of the score and the synth settings. Test the knobs, sliders and pads for resistance and response. Do they easily trigger an effect? Determine your budget. Be willing to save your money for a couple of months to purchase quality. You could buy a simple controller for a small investment immediately, but you may exceed its capabilities quickly. 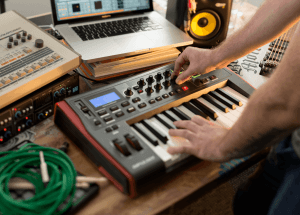 Saving for a more advanced model lets you purchase a MIDI controller with more features that can take you from amateur to professional performances. You won’t need to save for long because even top of the line controllers only cost about $400. Determine whether you need a device for use in the studio, in live performance or both. Will you use the MIDI controller as a notation device, as a musical instrument or simply as a control surface? A device with slim keys works fine if you’re only using it for simple note entry on a piano roll, but you need full-size keys for a controller to use in live performance. As your compositions become more complicated, you’ll find buttons, knobs, and sliders help you edit and create custom settings. Drum pads can not only help you devise drum lines, but let you program each pad for a specific beat or set of beats. With a single mode change, tapping the pad triggers that beat. The buttons, knobs and sliders come in handy during live performance to quickly trigger presets. Some controllers draw power from the computer via USB cord. Most provide an optional wall adapter for plugging into a standard electrical outlet. Some do not. Your level of experience a pianist and as an audio engineer influences your choice of controller. Beginners will probably find it easier to use a keyboard with full-size keys since they’re easier to trigger. If you have experience with simple note entry using a controller and piano roll mode, you won’t have problems with a slim key model. If you’re just starting out as an audio engineer, a complicated keyboard controller may be daunting. A lightweight device makes it easy to transport, but a heavy weight can add to its durability and can signal many features. Lighter works better if you need to transport it to gigs. Many MIDI controllers and keyboards now use only USB power cords that connect to the computer for power. This can present a problem for those who need to use the controller in a live performance. While some devices do offer an optional standard power adapter, you’ll need to purchase it separately. Some users have reported problems installing the power adapter drivers to Mac computers. This has occurred with Roland devices and those devices could not charge by alternate means. Consider the situation in which you’ll use the device before purchasing. Your controller needs to fit your needs and budget. We hope this buyer’s guide helps you choose the right one. Whether you need an ultra-light device you can take with you or a full-size keyboard with a bevy of knobs, faders and drum pads, you can find a controller that fits your needs and works well with Logic Pro X. You can expect to pay between $100 to $400 for a MIDI controller that works well with Logic Pro X.
I am Anthony Petit and I am the founder of whatever-tech.com. I became interested in technology when I was a kid. As a teen, when my friends were excited about attending sporting events and music concerts by the hottest artists, I was more interested in going to see and test out the latest tech gadgets at electronic industry trade shows. I was fascinated by all the technological wizardry. Some posts may contain affiliate links. Whatever-Tech.com is a participant in the Amazon Services LLC Associates Program, an affiliate advertising program designed to provide a means for sites to earn advertising fees by advertising and linking to Amazon.com (amazon.co.uk, amazon.ca, amazon.fr etc.). 2018 Whatever-Tech.com All rights reserved.